Dhanusri is 7-year-old child born to parents who are both blind. She was detected to have Retinoblastoma that is cancer of both eyes at 3 months of age. The Right eye was removed and with appropriate Chemotherapy she was well. She can see with her left eye and was going to school. In 2016 she had a relapse of the disease. Now with appropriate drugs, her disease is in remission. However, to ensure that the disease does not recur, high dose chemo and an Autologus Bone Marrow Transplantation is required. This will cost about Rs. 8, 00,000/-. Her father, Marimuthu, is a keyboard player with a choir group and gets work intermittently. Her mother, Seethalakshmi, also sings with her father whenever they get called to perform. But they last few years have been very difficult for the family. Marimuthu dropped out of college due to financial constraints. Seethalakshmi has a degree in B.A English Literature. But the couple is unable to find a job because of their physical disability. Since they have no financial support, the family has been begging for alms at Meenakshi Amman Temple to make ends meet. Dhanusri is their only child. 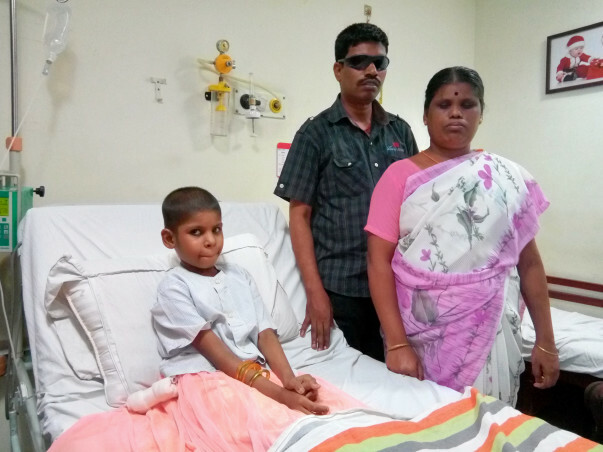 They wish to give her the best treatment available so he can live a disease free life. Please help this family in any way you can. This is an update of 7 years old Dhanusri, Metastatic Retinoblastoma. Dhanusri has unfortunately relapsed of Retinoblastoma in the spinal cord after Bone Marrow Transplantation. Since it is a very refractory resistant disease. Thank you for supporting Dhanusri and her family in their time of need. This is an update regarding Dhanushri, she had a "Retinoblastoma". 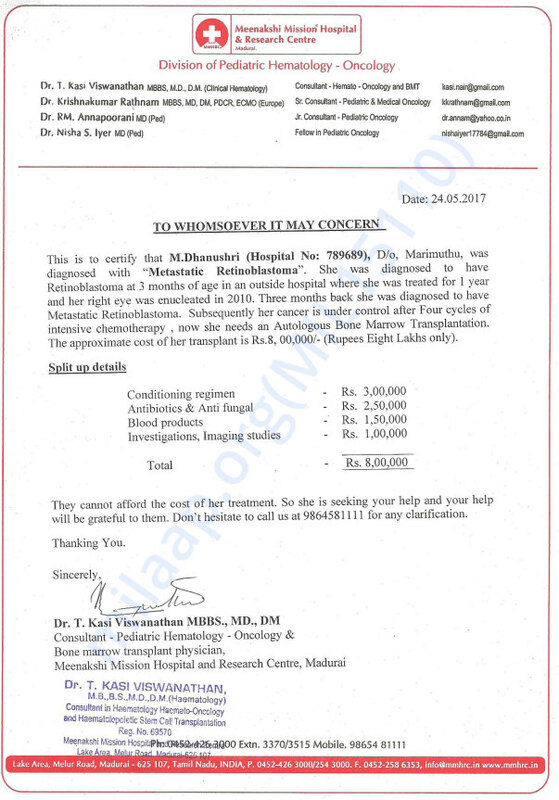 She underwent Autologous Stem Cell Transplantation successfully. She is day twenty-eight post Autologous Bone Marrow Transplant and is doing well. Thank you for your donations towards our Patient Baby Dhanushri through Milaap. We ensure you that your donation would save the life of Baby Dhanushri affected by Retinoblastoma. We trust that with the support of generous donors like you, we can confidently fight against cancer and save the lives of poor little children. On behalf of our Board of Trustees and staff, we express our deep appreciation for your generosity and support. Please continue to assist us in our noble cause. Best wishes to you and your family for good health, happiness and prosperity. Our best wishes & prayers for the well being of Dhanusri's Life.